Your windshield is built to be a strong, transparent product that resists the dangers of the road while allowing you to clearly see what lays ahead. While built to resist chips, splits, scratches, and UV damages, the windows that comprise your car or truck are made of glass. Over time, chips and cracks can begin to form and worsen, impacting your ability to see and possibly leaving you vulnerable to fines from local law enforcement. In most cases, car glass repairs or replacement are the two options. Alpine Auto Glass is here to serve as your trusted team for windshield replacement in Williston and the surrounding areas, delivering comprehensive care to each of our customers to ensure the safest and most cost-effective outcomes. If your vehicle is in need of car window repairs or replacement, the Alpine Auto team is ready to help. Read more to learn more about our quality services, and be sure stop by our auto glass shop for assistance! Finding a new chip on your windshield can be upsetting. Oftentimes, this minor abrasion comes from an impact with a small rock or pebble that was loosed while from a vehicle in front of you on the road. While this minor impact may not seem like a big ordeal, the truth is that even the most minor damages can lead to the need for auto glass replacement services. Changing weather conditions can place a lot of strain on your vehicle’s glass, as temperature directly relates to the expansion and contraction of cells in trees, water, and more. Extreme differentials in temperature can weaken your windshield and cause it to warp, turning small chips into long cracks. Chip or crack size. If it is over six inches, you’ll generally need a windshield replacement! Amount of damage. If you have three chips, for example, there is a high potential for these spots to connect and create future concerns. Chip location. If your chip or crack is in your line of sight, it will need to be remedied immediately. Edge concerns. If your windshield is damaged along the edges, serious concerns can arise. North Dakota drivers who fail the previous criteria will likely be required to replace their auto glass. While many drivers try to avoid financing this project, the truth is that the safety and integrity of your vehicle are more important! Our team can help to provide Top Rated Local® glass repair and replacement services, enhancing your vehicle for long-term enjoyment. We Offer Car Glass Services for Fleets, Too! Your business may cover a lot of miles across North Dakota and Montana, and your fleet will likely show the wear and tear. Commercial vehicles in need of auto glass repairs or replacement can benefit from working with the Alpine Auto team. Our staff can work with you to develop a personalized care plan that keeps your fleet safe at all times, delivering installation and repair services as needed. No matter your auto glass needs, our car glass repair and replacement experts are here to help North Dakota drivers. 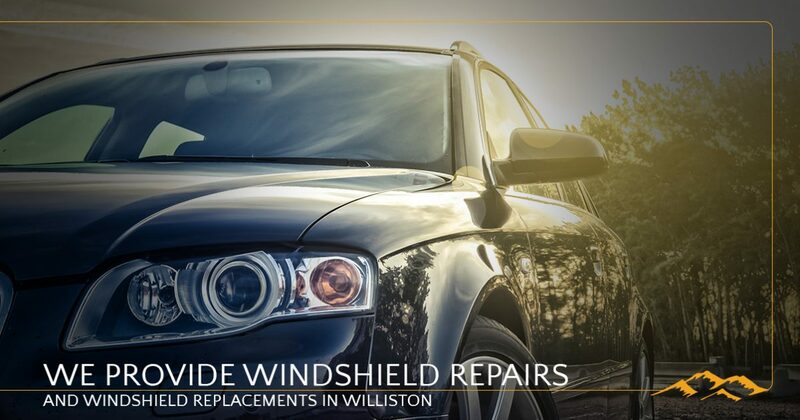 We proudly provide unbeatable windshield replacement services to Williston and beyond, relying on the best products and services to keep you safe no matter what the road throws at you. Alpine Auto Glass is here to deliver, so be sure to contact us today for more information or to receive a free consultation for your needs!